You are not alone. Begin to heal with other male survivors of sexual abuse in a safe and confidential space. For more information or to register, call Diana at (807) 684-1878. Wednesday, September 5, 2018 – Thunder Bay Counselling announced today it needs volunteer mentors to help positively change the lives of young people. Twenty-five people are urgently needed to be mentors to youth for their upcoming CHOICES program. The CHOICES program is designed specifically to provide youth aged 12-17 with healthy coping strategies. Mentors participate once a week for ten weeks, supporting youth in a group setting to think and act positively, and feel more confident to choose the right direction in life. Programs are offered in both school and community settings. Most importantly, it provides youth with an opportunity to talk openly about their concerns and worries in a safe environment. People of diverse backgrounds, cultures, ages, sexual orientation, gender identities are wanted to talk about and explore issues such as: self-respect, goal setting, decision-making, relationships and social media. CHOICES program mentors are provided with mandatory orientation and training prior to the program start. Volunteer mentors must be 19 years of age or older and be able to attend the one-day training Saturday, September 22nd, 9 am to 5 pm. safeTALK is an alertness training that prepares anyone over the age of 15 to become a suicide-alert helper. Through words and actions, most people with thoughts of suicide invite help to stay alive. 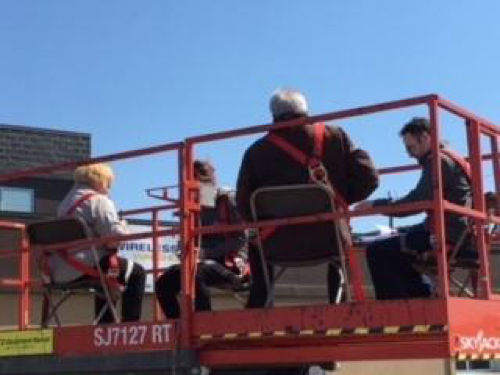 Thunder Bay Counselling was thrilled to once again participate in the United Way’s Annual Great Billboard Rescue on May 17th 2018. This year’s event raised $90,000 that will help to fund programs and services at 30 local agencies. Many thanks to our supporters and everyone who donated to the Great Billboard Rescue. Your ongoing support is greatly appreciated! THUNDER BAY, ON, JUNE 15, 2018 – Today, Thunder Bay Hydro introduced the new AffordAbility Fund Program in Thunder Bay and northwestern Ontario. The utility has partnered with local community services to deliver the program that is designed to alleviate electricity bill costs for residents and families with moderate incomes. Those who qualify for assistance through the Fund will receive free energy saving upgrades to their home that will make it more energy efficient and help reduce their electricity bills for the long-term. Upgrades include a Home Energy Kit with products which may include ENERGY STAR certified LED light bulbs, power bar, faucet aerator, along with energy-saving tips, while customers demonstrating a greater need, could qualify for equipment such as new appliances, programmable thermostats, and building insulation. Whether residents rent or own, or live in a house or an apartment, they can be eligible for the AffordAbility Fund Program. The level that they qualify for depends on net income and average energy bill. Those that are eligible for the AffordAbility Fund Program do not have to pay for the upgrades or installation with the program offered free of charge. “Older households lack adequate insulation and usually have dated and less energy efficient appliances. Small changes through the AffordAbility Fund Program can make a big difference. A program like this can be really transformative for a community. The AffordAbility Fund Program provides vital support for people that need it the most,” continues Wilson. To apply for the AffordAbility Fund Program, visit affordabilityfund.org or call 1-855-494-FUND. Those that start the process will be asked to answer a quick questionnaire. The AffordAbility Fund Program will also be offered in Atikokan, Fort Frances, Kenora and Sioux Lookout. Information sessions with potential community partners will be held in the communities between June 18th and June 20th. 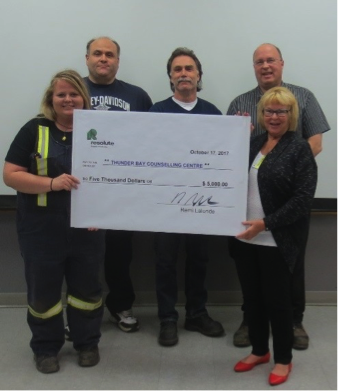 On October 17th, 2017, members of Resolute Forest Products’ Thunder Bay Management team and Joint Health and Safety Committee presented a $5,000 donation to Thunder Bay Counselling Centre Executive Director, Nancy Chamberlain. Through the company’s Board of Directors Safety Award program, Resolute can earn $5,000 to add to annual community contributions for every 250,000 hours worked without a recordable injury. 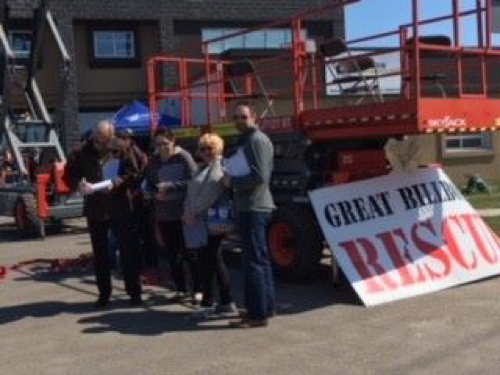 The Thunder Bay mill employees worked for over 250,000 consecutive hours injury-free, achieving an important safety milestone and earning $5,000 to donate to the organization of their choice. The Joint Health and Safety Committee reached out to Thunder Bay Counselling to offer support for its local programs. In 2016, Resolute donated nearly $190,000 to charitable and community organizations chosen by employees, who contributed to the company’s outstanding safety performance. Thunder Bay Counselling is the leading provider of counselling, education and support services in the Thunder Bay area, offering both personal and workplace support services to help people make positive changes in their lives. Child Protection Alternative Dispute Resolution (ADR) is intended to improve the outcomes for children and their families who are, or may become, in need of protection, and their families, by offering a strength-based, inclusive and collaborative approach to resolve child protection issues or disputes. Thunder Bay Counselling currently provides two methods of Child Protection ADR: Child Protection Mediation and Family Group Decision Making (FGDM) (also known as Family Group Conferencing (FGC)) in the Districts of Kenora-Rainy River, Thunder Bay, Algoma, and Sudbury-Manitoulin. We are seeking Expressions of Interest from qualified professionals interested in receiving training to become FGDM/FGC Coordinators to provide service in Thunder Bay and Kenora-Rainy-RiverDistricts. Applicants must participate in all aspects of the training, and a subsequent mentorship, to be eligible to be placed on the provincial rosterwhich is a requirement to become a coordinator. Commitment to continuing personal and professional development. We encourage individuals with diverse backgrounds representative of the diversity of the population of Northern Ontario to apply. Cost of the training and materials is $600; subsidies may be available to support the training. Mentorship is successfully completed with a recommendation form and letter from the mentor to the FGC Provincial Resource office indicating that the mentee has acquired the necessary skills and experiences, and is deemed capable of coordinating conferences independently. Mentees cannot coordinate conferences independently until mentorship is completed and they are registered on the FGC Provincial Roster of Coordinators. Completion of training and mentorship, as well as placement on the FGC Provincial Roster, does not guarantee future contracts or employment. Child Protection ADR is a voluntary service in the Province of Ontario. As such, programs are subject to fluctuating demand and need for service providers. Thunder Bay Counselling is interested in securing contracts with trained and rostered individuals in Thunder Bay and Kenora-Rainy River District to provide services on a fee for service basis. Please note: Your submission will be acknowledged by email. If you do not receive a response to your submission, please contact Sheri Fata at (807) 684-1880. Thunder Bay, Ontario; September 19, 2017: – Thunder Bay Counselling is taking a lead role in partnership with the Lakehead Social Planning Council to address the priorities of the Ontario Poverty Reduction Strategy for Thunder Bay residents. With support from Prosper Canada and funding from the Ontario government, Thunder Bay Counselling and the Lakehead Social Planning Council will now be offering expanded and free financial counselling services to improve the wealth of individuals and families living in Thunder Bay. Thunder Bay Counselling will be undergoing some minor renovations between July 24 and August 4. During this time, it will be business as usual, although there may be temporary interruptions to phone and fax services. Thank you for your patience. Thunder Bay, ON, June 1st, 2017 – Today, Thunder Bay Counselling Centre welcomed past and present staff, volunteers, board members and the community to join the organization in celebrating 50 years in Thunder Bay. Several events were held throughout the day to commemorate the milestone and the evolution of counselling services in the community. Attendees took a journey into the past to present day through themed historical era rooms at the centre, which included speakers and interactive displays. Keynote speakers also shared stories of their involvement with the centre from early beginnings to new programming. Thunder Bay Counselling started out with very humble beginnings. Back in 1967, a group of dedicated individuals identified an unmet need in the local community and incorporated the Lakehead Family Service Agency. “Despite some tough times that nearly resulted in the organization closing at one point, our dedicated staff and volunteers were able to persevere. Over the years, Thunder Bay Counselling responded to the needs of our diverse community and introduced new programs and services to meet those ever-changing needs;” explains Thunder Bay Counselling Board Chair, Nelson Sidorski. The organization currently serves more than 5,000 clients every year in Thunder Bay and across Northwestern Ontario. Services are provided in Addiction & Mental Health, Budget & Debt Management, Child & Youth, Counselling, Education & Training and Employee Assistance.